Your Wedding is unique. You spend a lot of time and money planning it. Vancouver, being situated right smack between the ocean and the mountains, has some of the most amazing mixes of urban and natural landscapes on the planet. Then why on earth would you settle for run-off-the-mill wedding pictures? Stand there (snap), look this way (snap, snap)…. get a thumb drive… done. So, it is our job as photographers to show our brides the possibilities, educate them on what could be done for them. Show them that their wedding can be turned into unique pieces of art. A R T.
Ahhhh hello???? Anyone out there? Isn’t that the definition of what your wedding photos should produce? Create something that lasts, that is meaningful to you. Something that inspires. Something that you like to look at. Something you are proud of. Something that is so different from what other people have that it truly represents …. you. Now, it has been said numerous times that great photographs are taken on both sides of the camera. Meaning: You, the model, as well as your photographer, have to both be willing to go the extra mile, and collaborate on your vision. Ahhhh, yeah. Both of you have to have an idea in mind. A grand, epic idea of what an image that represents you should look like – and why. So, with that in mind, we will be publishing a mini series of samples where our clients went the extra mile with us. We will show you the final result with the ideas that went into it. Then, in a later post, we will show you how the picture was created. To show you that YOU, too, can have … well… better pictures. 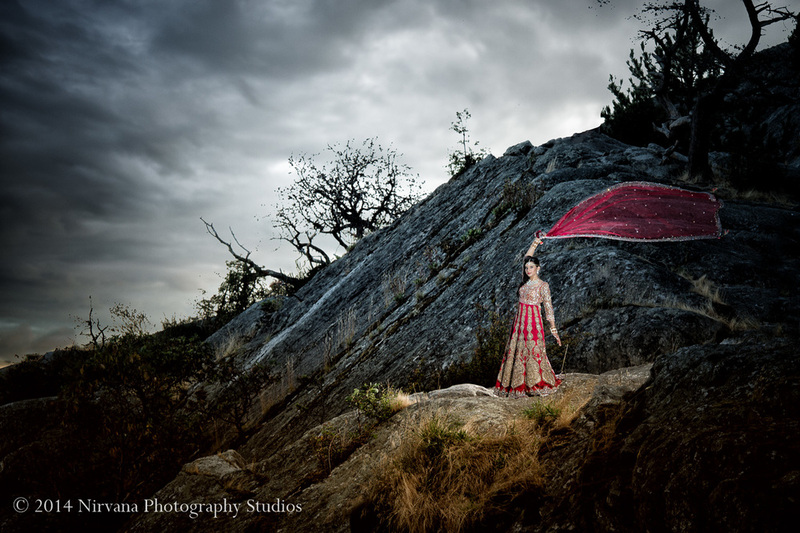 Our bride, Kalpana, loves the outdoors. Hiking, camping, running – you name it. So it’s not a far stretch to shoot her… well… outdoors. Now, it’s easy to shoot someone outside, in the sunshine, maybe even *gasp* a sunset. Maybe throw in some strobes for nice lighting while you are at it, and the result is a “pretty”… colorful, and – for the most part – completely boring picture. Sure – you’ll get excited, post in on facebook, and in a few days you will have forgotten all about it. Your friends will congratulate you, and half of them compare your picture against the pretty much same one that they had when they got married. Getting married is hard. Moving in with your spouse for the first time is hard. Living with each others intricacies, making it work… it’s hard. You married people out there know what am talking about. In this picture, Kalpana is battling the storms of life. She is a light, shining in the darkness, strong against the wind blowing in her face. With a smile on her lips, she uses her veil to play with the storm and demonstrates timeless beauty and light in the darkness. You may not like the style… but is it meaningful? Totally! Does anyone else have a picture like this? Nobody. Did the bride have to work for this? Ahhh yeah. Did we have to fear the Mother’s wrath had we ruined the sari? Damn straight (and don’t you underestimate the pressure ;-)! Is this, printed on canvas, nicely framed in a floating dark wood frame, an impressive wall piece that makes everyone stop in their tracks? Drop by the studio and judge for yourself…. Elopements are a completely different kind of wedding. They are often fast and unplanned. But many times, they are planned with the idea of simplifying the process. A couple will choose to elope so that the event is a special occasion just between the bride and groom. Other times, they find it easier to do things their way when their families clash. Either way, the day usually consists of only witness to the wedding or a handful of guests. It’s usually much shorter than other ceremonies and there isn’t a large banquet after. Inspirations for headless portraits, focusing on boutonnieres. Little IPhone pic snapped 1 h before the ceremony My last week was pretty much a write-off as I had to participate, as a guest, in an Indian wedding ceremony….